Screw planking. 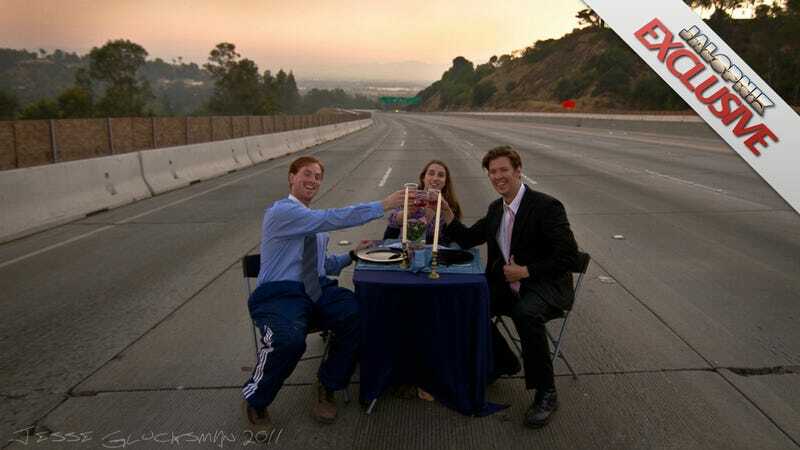 The photo of this trio on the 405 highway during this weekend's shutdown raised the bar for Carmageddon stunts — along with their glasses. We tracked down the photographer, Jesse Glucksman, the fourth of the merry band of misfits, and he exclusively told us who they are and how they did it. So, was it three or four of you? And who are you guys? It was three in the shot and me with the camera. Left to right, Matt & Amanda Corrigan and Barry Neely. We all went to Emerson College together and Matt & Amanda recently got married. What time did you take the photo and where on the 405 was it? It was before 6 am, in Sherman Oaks a mile or two north of Ventura Blvd. Last week Matt & Barry scoped out a location where the freeway was totally unguarded except for a fence, a steep hill of crumbly soil, a wall, construction workers & police in a helicopter and car down the road. We hopped the fence & climbed the hill all while carrying the table, chairs & place settings, found a gap in the wall, set up and posed while I frantically shot a couple dozen photos and got the heck out of there when a construction guy drove up and told us to scoot, informing us that we were lucky it was him and not a cop. Better question, why did you do it? How often do college educated professionals in their late 20s/early 30s get to do something so ridiculous? I've got kids, man. I never have time to really have fun.